Robert Niero spent 13 years working in a bank before marrying the late Jean Pinchon`s daughter and thus inheriting holdings in some of Condrieu's most illustrious vineyards. He made further purchases and now has just under 6 hectares of vineyards. . The Syrah grape variety, from which Côte Rôtie is made, is cultivated in the community of Ampuis in La Vallière (0.60ha) and Semons in Coteau de Bassenon (1.20ha). Since 1994 Robert has vinified separately the Viogner grapes from his holdings in the Coteau de Chery and La Roncharde vineyards (the latter goes into Condrieu Les Ravines). The average vine age in the Coteau de Chery is high (30-50 years old) and the wines are powerful, well-structured and often exotically rich. 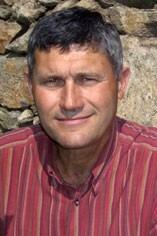 His son Rémi joined the domain in 2004.